Alexander Prinsen is an Eco-Innovation Expert, Speaker and author (in progress) on Sustainable and Circular Business models. He helps Business implement and accelerate in Circular+Innovative+Sustainable solutions. Because all Matter counts. He brings a refreshing view on how Ecological Thinking based on Physics, Biology and Bio-Chemistry will change Business Models for the better. Alexander blends a visionary future based on trends in Design, Art, Science and Entrepreneurship on business models that do good for Business, Nature, Communities and Humans. To the point, so we can get to get done what is needed. I provide highly interactive Keynotes to fire start your strategic sessions on Sustainability, (Eco)Innovation, Business Modelling. For action-driven advise, consulting and expertise… or for a good business coaching sessions. For longer periods I support teams and organisation with implementing strategy and hands on on the job action. For Organisations I support teams with Business Development activities to help grow their business and build their (inter)national network. Using my extensive network I am able to support to help organisations get connected with the right person or suppliers. Are you Bold enough to go on a systemic journey with me? Through The Zero Waste Consultant I assist organisations to bridge Ecological Thinking and Economic Doing. Through the Masters Of Beautiful Achievements MBA Academy I share my insights through my research, podcasts and webinars. This is where you can find more about my insights and progress. We live in an exciting time period of human history. Our society is being challenged from many directions at the same time. All signs are indicating we are entering a new industrial Era and the rules of the game need to be rewritten. How to do we deal with all these challenges? Where to find the basic knowledge and develop the mindset to take on our future challenges? Alexander Prinsen is a global speaker and author on innovative sustainable business models. Alexander helps companies to look beyond the borders of their domain to innovate in a smarter way. Alexander believes there are positive alternatives how to operate our business models and how to interconnect the relationships between business, communities and the environment. 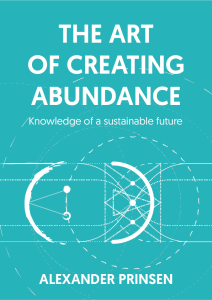 His latest research and project, The Masters of Beautiful Achievements, is being turned into a management book ‘the Art of Creating Abundance‘, on what we can learn from zero waste profitable business models. People who have seen Alexander in action, know how infectious his energy is. Seeing and working with Alexander will energize you into a “Can do” mindset, his wide variety of innovation and creativity topics are always thought-provoking. Afterwards you will have a great set of insights to discuss with your friends, colleges and business partners. Alexander’s presentations are always a wake-up call, making you think about your (sustainable) challenges differently. What makes Alexander so unique is not only the content he shares, but also the way he presents it. Alexander is a born facilitator mixing personal insights and anecdotes with humor in the how business & life intertwine. With over 10 years of experience in the field of business development, team building and innovation consulting, in nearly all industries, Alexander is able to relate to the specifics in any given sector, sharing tangible ideas, spot-on inspiration and actionable advice. The combination of speaker and facilitator is where Alexander excels. Alexander loves to travel. He is a globetrotting Dutch now living in Rotterdam The Netherlands, and working globally to service clients. See Alexanders’s full resume on Linkedin and see here what clients say about Alexander. Tijdens de landelijke inkoopdag voor drinkwaterbedrijven, met als thema circulair inkopen, heeft Alexander ons in een vogelvlucht meegenomen in de wereld van de circulaire en de blauwe economie. Inspirerende voorbeelden van over de hele wereld tezamen met de bevlogenheid van Alexander geven je voldoende stof tot nadenken. En niet alleen dat, het geeft je ook voldoende aanleiding om vooral te DOEN! As an independent researcher, circular business model expert and entrepreneur I’m supporting professionals and companies generating more value out of business (Eco)nomics using (Eco)logy as starting point. I will inspire, empower and enable individuals, teams and companies to move beyond dreaming and start to make the future happening. My Keynotes, Moderation and Facilitation sessions are infectious and after meeting me you will want to start implementing yourself ! Love to hear how we can collaborate !